With websites playing a critical role in NIU’s initial communication with its many audiences, having a consistent university-wide message has never been more important. 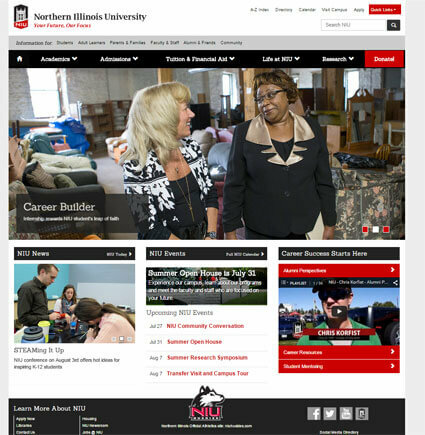 NIU web pages represent and promote the entire university, as well as many specific programs and departments. For that reason, newly designed university-wide templates were introduced to create a cohesive experience for all online visitors. O’Brien said the templates are built using an approach called responsive web design, which adapts the layout and the navigation to a view best-suited for a particular device, be it a smart phone, tablet, laptop or a desktop computer. In addition, the templates comply with the Illinois Information Technology Accessibility Act, making them user-friendly for everyone. 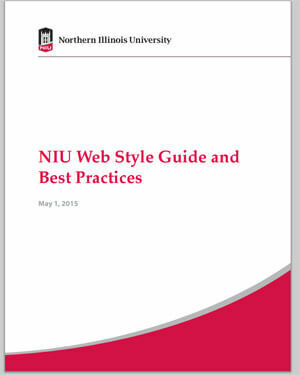 In addition to the new templates, web standards were implemented to expand upon NIU’s original web policy, and are outlined in NIU’s Web Standards manual. East said the enhancements were necessary, considering the increased role NIU’s website plays in recruitment and retention. Cascade Server is NIU’s official web content management system, and is supported by the Office of Creative Services web team. Any user can request help from the web team by submitting a website update request form, and the web team will make the requested changes. A committee, consisting of pagemasters from all colleges and several divisions of the university, meets regularly to provide an open dialogue to address web-related topics, teach best practices within the industry and learn from one another. Whether your goal is to communicate with future NIU students, current Huskies or the many alumni, there are tools in place to ensure a unified approach. Need more information? Call the Cascade Help Line at (815) 753-1326. The web team also offers one-on-one training to NIU pagemasters as needed.